I love to watch the birds that come to my goldfish pond and bathe and get a drink. This is baby bird season, my favorite time of year, and I’m getting a lot of baby birds coming to my pond for their first bath and drink. Yesterday I got a new surprise! I get to add a new bird to my backyard bird watching list as well as my Bird Watching Life List. For the past several weeks, I have seen a flash of a brown bird with a long tail. From what I could tell from my stack of bird watching field guides, it was a brown thrasher, but I could not be sure. Finally, yesterday, one of them landed at the pond while I was on my bench, and I got a good look at it. 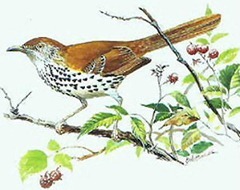 Yep, it is a brown thrasher! I love to get a good look at one of God’s creatures! Yesterday I saw three male goldfinches in full bright yellow breeding plumage, and three females. Since I have only seen a couple of goldfinches in my life – mostly drab non-breeding plumage, this is a big deal for me. 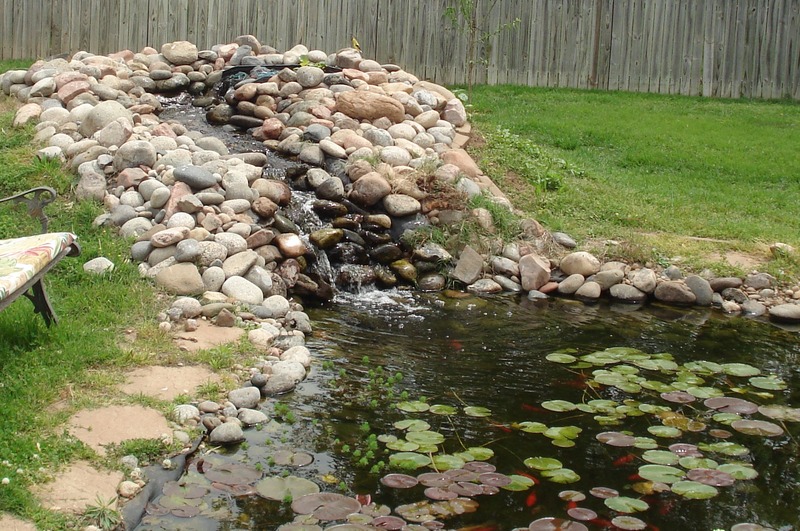 It’s mating season, and soon baby birds will come and get their first drink and bath at my pond. Decisions decisions – There are many Warner Bros studio history books to choose from! My hubby asked me what I wanted for Christmas. I decided that I would like a history book about the early Warner Bros studio. My favorite era for movies is between the years of 1939 to 1945, and my favorite studio is Warner Bros. I thought it would be fun to have a reference book as a companion to my favorite TV channel, Turner Classic Movies. All of the books I have found on the internet are available at Amazon.com. I’ve been flipping back and forth between the pages of Amazon.com, but I thought it might be easier to write down all the details in one place and decide that way. As long as I’m going to all this trouble to write it all down, I thought I might as well post it in my blog while I was at it. Perhaps other people might be looking for books about Warner Bros studio and could benefit from my footwork. The Best of Warner Bros.
A look at the history of the studio from its early B-films, including serials and melodramas, through its production of The Jazz Singer, to the present features more than 250 illustrations in color and black and white. It has 192 pages, not very many for a history book. It covers the years from “early B-films” to the present, which is 1994 The cover has a picture from Casablanca my favorite movie of all time, but it also has a picture of Clint Eastwood. I like Clint Eastwood, especially when he played Rowdy Yates on Rawhide, but I’m not interested in movies that recent. The BROTHERS WARNER, formerly titled “Hollywood Be Thy Name: The Warner Brothers Story”, is the definitive family biography and intimate portrait of the four legendary Warner brothers. It unfolds and is told through the eyes of Harry Warner’s granddaughter, Cass Warner Sperling and in the voices of others who knew them. Customer Reviews: There are four reviews, and every review gave it five stars, the highest rating. This was written by a granddaughter of one of the four Warner brothers. It has a good deal of pages, and excellent reviews by the four reviewers. This covers the lives of the brothers, so it will certainly cover my favorite years for movies. It is a recent book, and there are new copies available for $20.99. This one is certainly a possibility! Since 1928, Warner Bros. has produced thousands of beloved films and television shows at the studio’s magical 110-acre film factory in Burbank. This collection of evocative images concentrates on the Warner Bros. legacy from the 1920s to the 1950s, when timeless classics such as Casablanca, The Maltese Falcon, and East of Eden came to life. It also looks at WB’s earlier homes along Hollywood’s “Poverty Row,” the birthplace of Looney Tunes, and the site of WB’s pioneering marriage between film and sound in the 1920s. Early Warner Bros. Studios also tells the tale of four brothers–Harry, Albert, Sam, and Jack Warner–scions of a Polish Jewish immigrant family who rose from the humblest of origins to become Hollywood moguls of enormous and lasting influence. Customer Reviews: There are two reviews, and both gave the book five stars, the highest rating. The description says it covers the years “1920s to the 1950s”, my favorite years included. You can search within this book, and it appears to have many photographs. New books are $14.95. This sounds like something I would really like! Amazon.com Customer Reviews: Two reviewers both gave five stars. The reviews sound like it is a great DVD, but I think I would rather have a book. Amazon.com Customer Reviews: Only one person wrote a review but gave the book four stars. The title alone makes it sound like this book is right up my alley. It covers the years 1935-1951, so my favorite years 1939-1945 is covered. It has a good number of pages for a history book. I have seen the author on Turner Classic Movies documentaries. He is a film historian. This is an older book, so no new copies are available, but used copies in good contrition are available at very low prices. This books sounds like something I would really like! photographic tour of the studio “behind the scenes” from its earliest days as First National Pictures in the 1920s through the golden era of Bogart and co. It sounds pretty good, but there are a couple of other books on this list that sound very good. From Rin Tin Tin to Casablanca to Harry Potter, the Warner Bros. story is the history of Hollywood. Eighty-five years of screen icons, legendary films, and history-making achievements are detailed in this comprehensive, photo-filled treasure trove, fully authorized by the studio. No production company has had more legendary films, stars, or influence on the course of Hollywood than Warner Bros. Among the superstars who worked for the studio are Bette Davis, Humphrey Bogart, Lauren Bacall, Joan Crawford, Marlon Brando, James Dean, and John Wayne. Filmmakers like Martin Scorsese and Stanley Kubrick made history for the studio, and it has been home to blockbuster franchises like Superman, Batman, Lethal Weapon, and Harry Potter. Produced in conjunction with Warner Bros., this volume is the ultimate guide to the greatest movie studio in history. You Must Remember This: The Warner Bros. Story is also the companion to a five part documentary in the PBS American Masters series by author Richard Schickel that will premiere at the Cannes Film Festival in the spring of 2008 and debut on PBS in the fall, to coincide with publication of the book. “Customer Reviews” Eleven reviews with four people giving it the highest rating of five stars. I looked at this book in a bookstore yesterday. My favorite years only took up a fourth of the book. I am not interested in a book that is mostly not want I want. There are better books on this list. The power and the stories. The trends and trendsetters. The mirror that reflects our life and times. It’s Rick sticking his neck out for nobody. Superman rescuing Lois Lane. Bette Davis pumping lead into the man she loves. George Clooney masterminding a Vegas heist. Harry Potter wielding his powers. You must remember these…. Clint Eastwood narrates Richard Schickel’s perceptive 5-episode, 85th-anniversary salute to the studio that gained a four-footed hold with an unlikely star (Rin Tin Tin), championed tough guys and dames who gave the Depression and the Nazis the raspberry, countered the box-office onslaught of TV and emerged as a 21st-century giant. Art, business, stars, moneymen, America – it’s an enthralling tale. And it’s all here. Customer Reviews: Seven reviews, with two reviewers giving the maximum of five starts. This is a DVD version of the book described above. But, I would imaging that the book has a lot more information than a DVD would be able to fit in, even though it is five parts. Also, it includes years I am not interested in reading about. This is not something I want. It was published in 1987. There is no Product Description or any reviews. However, it has 480 pages, so there must be a lot of information in this book. Thank you for reading this far down!